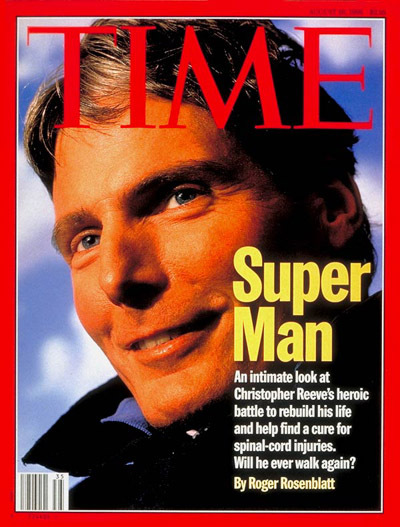 What happened to Christopher Reeve is known to all. In 1995, he made world news when an equestrian tournament turned disastrous as the horse he was straddling came to a sudden halt before a high jump fence, throwing him off and causing him to land head first to the ground. The actor awoke in a hospital five days later to be told that he was paralyzed from the neck down. He discussed suicide with his wife, Dana, who said that the decision was his to make, although should he choose life, she would never desert him. With her fidelity as his buttress, Reeve became a crusader against paralysis and spinal cord injuries, giving speeches across America as well as founding the Christopher Reeve Foundation, a research center dedicated to improving the lives of those with disabilities. Not since Reeve’s breakout role as the title character in “Superman” (1978) had his name been blazoned on front pages and magazine covers. His activism was a labor of love. It added to his shine, and it brought once more to the fore a romantic in Reeve that first endeared him to us in the movie that made him a star. The Man of Steel is invincible. Ever since his inception in 1938, comics, cartoons and a television series have ingrained this in us. Only a green crystal called kryptonite can destroy him. Yet even when confronted with this molecular foe, he manages to survive. Being the first superhero movie ever made, “Superman” touts the red-caped wonder according to our expectations. 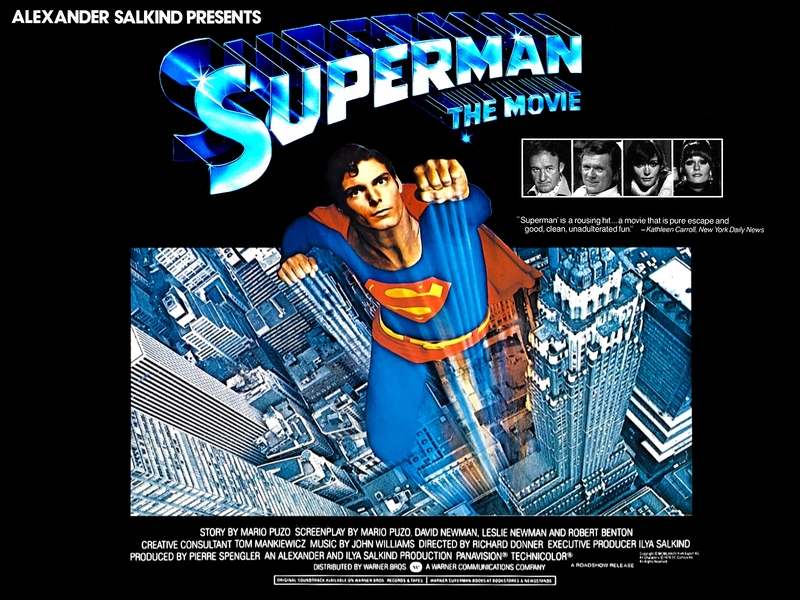 The man who roams among us mortals disguised as mild-mannered reporter, Clark Kent, holds up in mid-flight a plane that’s about to crash, carries a tug boat of marauders from the Hudson River to the doorsteps of a police station, and catches Lois Lane (Margot Kidder) midway during her fall down a building. Lois is a tough act. She’s Clark’s co-worker at the Daily Planet whom he’s not only infatuated with, but who also manages to get herself in jeopardy every 30 minutes. She doesn’t know it, but she’s got feelings for Clark, as well, though only when his glasses are off and he’s swooping around the city to save lives and fight crime. Clark must keep his identity secret… revelation would make him susceptible to potential adversaries… so to have a moment with Lois out of harm’s way (okay, a date) he grants her a favor as Superman: she would be the first reporter to get the scoop on this black-haired, blue-eyed, 6’4”, gravity-defying swashbuckler. Can you read my mind? Do you know what it is you do to me? Don’t know who you are, just a friend from another star. Here I am like a kid at a school, holding hands with a god. I’m a fool. Will you look at me quivering, like a little girl shivering? Can you see right through me? Can you picture the things I’m thinking of, wondering who you are, all the wonderful things that you are? You can fly. You belong to the sky. You and I could belong to each other. If you need a friend, I’m the one to fly to. If you need to be loved, here I am. Read my mind. When we fall in love, a fine line exists between what of our affections we expose and what we keep to ourselves. We are simultaneously strong and weak, intrepid and inhibited. Could this be real? we wonder. We want to shout that the view of the world from the stars is as poets imagine. Love has wings. 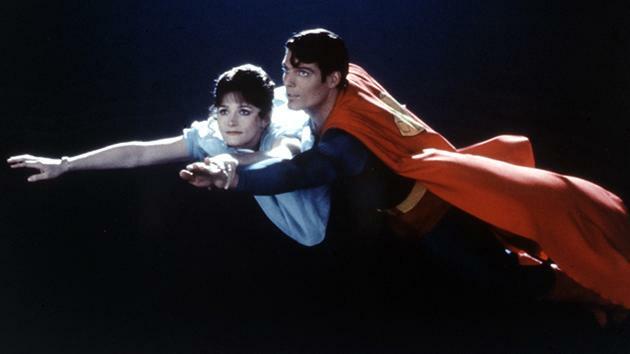 Superman takes Lois above the clouds on a voyage to the moon, regains a hold of her as she teeters, and brings her safely to the ground, both of them in an embrace with lips nearly touching and eyes keyholes to the mysteries of each other’s thoughts. Some interview. We want to shout love. Then again, no. She hardly knows him. He hardly knows her. This is just 20 minutes of a topsy-turvy ride. Maybe, Lois hopes, that given Superman’s ability to see through her dress that her underwear is pink, he could read her mind. With words, we bluff. Behind silence, we hide. But our thoughts never lie. Inevitable. You all know what dreams I’ve got – quite simply, to write and to be read; hence, this blog, which serves as an emotional outlet without the complexity of a novel. It is also readily available on the internet – a comfort from the close hits I have had in which the right people have read my more ambitious works, only for disquietude to result as their interest fizzled out. “I admire your persistence,” a neighbor told me the other day. “This is what I set out to do,” I responded. Herein lies the Superman in me, if not in physical strength then in a merciless endurance for rejection, for through the years, with every setback, writing has come to encompass a great deal more than the self. “You’ve got to give more than you take,” Reeve has said. (https://www.brainyquote.com/authors/christopher_reeve) And so I owe it to all whose stories have invigorated my creativity to make it. Christopher Reeve was truly a man who abided by his own words. His discovered a reason for living in the lives he gave others. Even in a wheelchair, he continued to fly the world in order to right what he believed was wrong. He was Superman to the end, an artist and a lover, and he made us aware of the superhero in all of us: if we could find the strength to unleash the talents we possess that our dreams are made of, then we could fill the world with poetry.